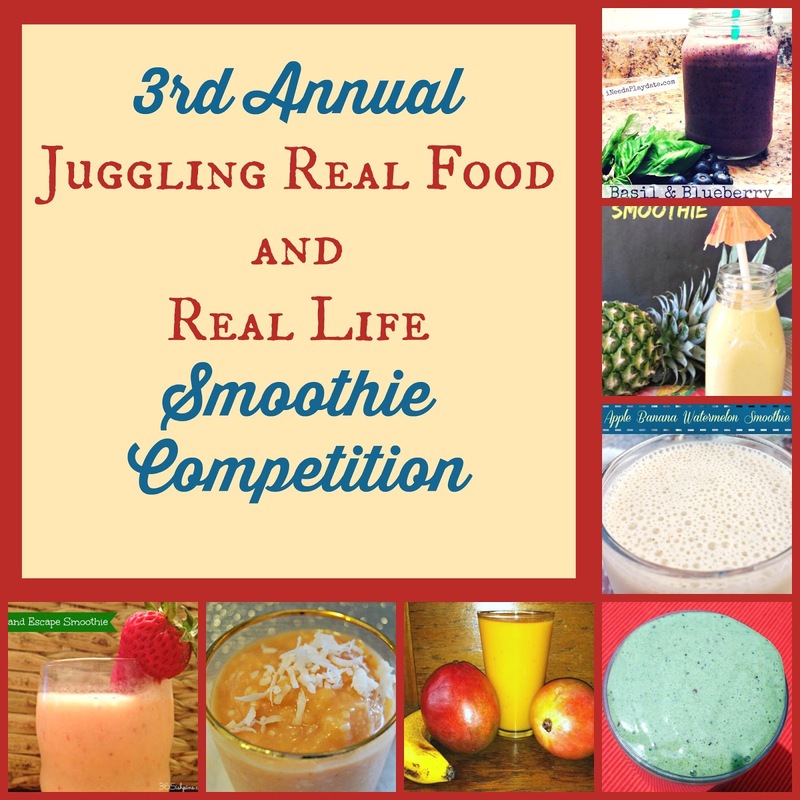 The Juggling Real Food and Real Life Smoothie Competition is one of my favorite events of the year. It’s a great time to get to know other bloggers and their recipes. You know it is going to be delicious! The competition will begin on July 20th. I will introduce you to one blogger and smoothie recipe each day. The official winner will be determined by counting the number of comments left on the recipe posts. This is a friendly competition, but everyone wants to win so make sure you leave a comment for your favorite recipes. The winner will be featured in my sidebar. That’s kind of a big deal! I have some great bloggers lined up already, but there is still time to enter. If you would like to participate, please send me a quick note and let me know you are interested in the competition at jugglingrealfoodandreallife@gmail.com. It’s quite simple really. I love smoothies! My family enjoys smoothies as frozen treats. We usually keep them very frozen (lots of ice and/or frozen fruit) and eat them with a spoon. We are pretty obsessed with frozen treats and so I need to do all that I can to make sure that doesn’t get too out of control and we keep the nutrition going. I’ve also found that my little guy who refuses to eat vegetables will eat just about anything in a smoothie. I even got him to eat spinach. He was suspicious of the green color, but he gobbled it down. I’m sure my family will love me for saying this, but here goes…………..they need the fiber. Bad! Smoothies are a great source of fiber because of the whole fruit I use. Smoothies are also packed with as many vitamins and minerals that you can fit into your blender. Mary from I Need a Playdate was last year’s winner. 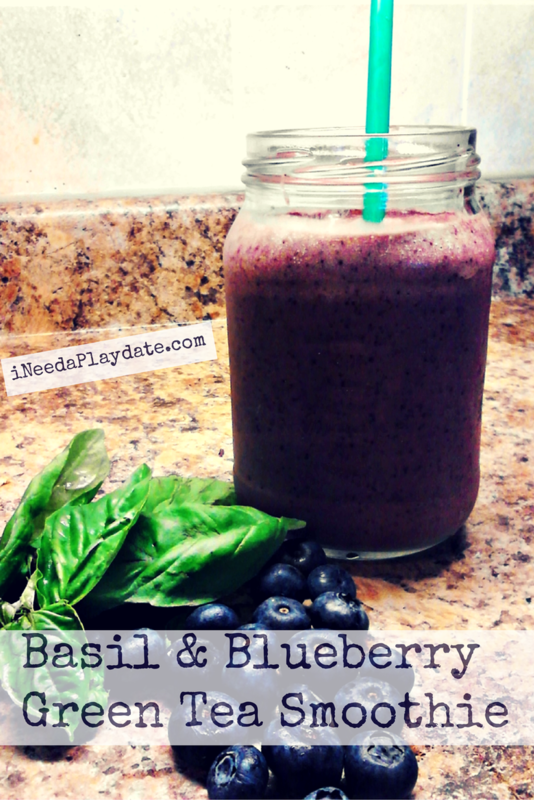 Check out her winning Basil and Blueberry Green Tea smoothie recipe and her blog for more fun. 1. Keep your overripe bananas in a bag and freeze them. It’s a great way to use up your older bananas and really sweeten your smoothie. 2. Keep a variety of frozen fruit available. The more fruit you have, the more flavors and nutrition you have available to make smoothies. 3. Use natural sweeteners. The fruit you use will really sweeten things up, but if you need a bit more sweetness, try a little squirt of honey. 4. Since we like to eat our smoothies as frozen treats, we like to mix in dark chocolate chips, coconut, and chia seeds. They add a bit of crunch that works when you are spooning your smoothie. Might make things a bit tough if you are trying to drink it through a straw, but not impossible! 5. Smoothies are a great way to get the kids involved in the kitchen. Let them create their own flavor combinations. Whatever they want. My daughter made an awesome peanut butter and jelly smoothie. The jelly was actually fruit, but it tasted just like peanut butter and jelly. We both loved it! 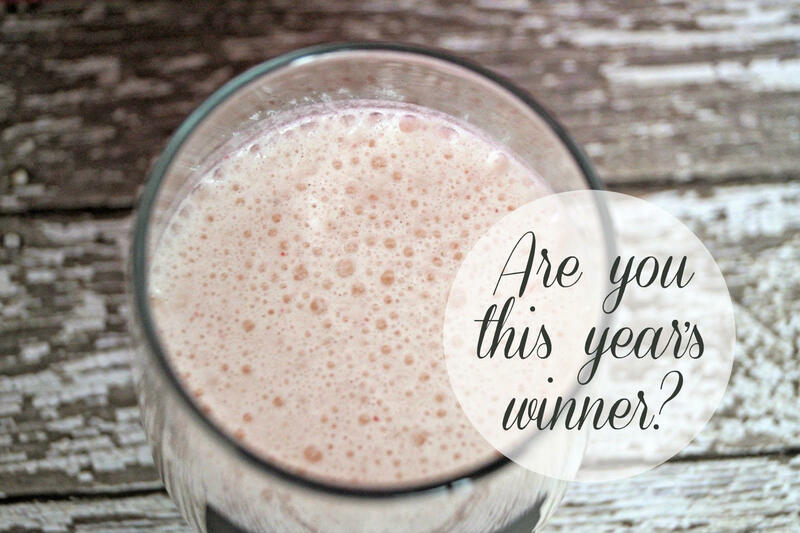 Make sure you check back for the smoothie competition starting July 20th. I can’t wait to see what my favorite bloggers come up with. Check out my smoothie shopping list and keep your kitchen stocked and ready for smoothies everyday. Make sure you subscribe by email so you don’t miss anything. You can subscribe by entering your email address to the right of this page. Just wait and see what I have coming. Please also follow me on social media. You can easily find me there if you have questions. Twitter is a great place to chat. Follow me @jugglngrealfood and introduce yourself. I can’t wait to talk to you! The Juggling Pinterest Boards are crammed with lots of great information and recipes. Check them out! And don’t forget to come back each Friday for our Let’s Get Real Friday Party. The best bloggers from across the web link up their favorite posts from the week. There is always lots of great healthy living information and fun.